In IT, you constantly juggle business-critical projects and push against deadlines. The business expects you to improve the quality of services while implementing projects that drive innovation. Use Flexible Credits to augment your Micro Focus Business Support offering with additional short-term services. Then simply redeem your Flexible Credits anytime during the 12-month period from purchase for additional short-term Support, Education, and Training or Consulting Services, when and where you need them most. Contact us and we will tailor our services to meet your needs. Flexible Credits are ideal for sourcing extra Support services to help you get the full value from your software solution. You can use your Flexible Credits for supportability assessments to ensure your environment is optimized and running without interruptions. We can also help you plan for upcoming product releases or review what patches are needed in your unique environment. Get help with on-site troubleshooting of a complex issue, or get a skilled engineer on stand-by when you are planning a key environment change. With Flexible Credits, we build a package customized to your needs. What’s more, Flexible Credits give you buying power throughout the year, avoiding extra procurement processes, so you can access a wide array of services when you need them. After you have leveraged our short-term services, you can continue to rely on us. We can provide you with personalized support through direct access to a named and designated support engineer, with availability ranging from phone support to dedicated on-site resources. Training helps maximize your product investments. Micro Focus offers training and education to make it convenient for you to gain the knowledge needed to install, configure, and administer the products and solutions you own. Flexible Credits make it easy for you to leverage the training you need, when you need it. 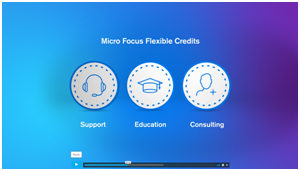 We will simply convert your Flexible Credits to Training Credits, so you can select from any of our education offerings on the Micro Focus Training Portal. Professional Services shape your strategy and transform your hybrid IT environment to capitalize on digital business opportunities. Let our team of service professionals help you make the most of your technology investment without burdening your IT staff. With Flexible Credits, you can leverage the time of one of our Consultants to upgrade an environment, design a cost-effective, secure and reliable solution, and transform your IT environment that delivers business value. Flexible Credits may be used for pre-defined durations of consultant time, with a minimum time of one week, and are not tied to specific objectives or deliverables. Micro Focus Consulting’s expertise and proven delivery methodology enable our customers to achieve tangible results and realize a return on their investment within an accelerated time frame.